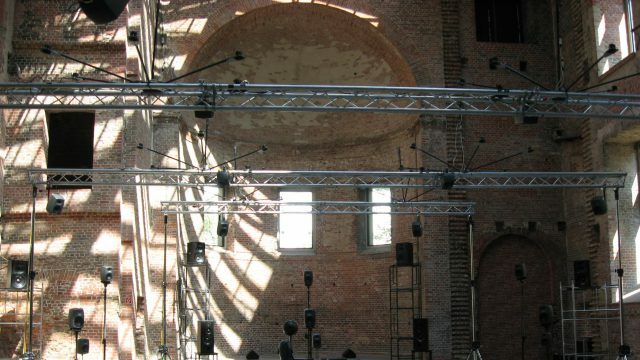 During the years 2002 and 2004 I made sound recordings in an Italian style opera theater built in 1908 in San Nicolás (Buenos Aires). My interest in this theater stems from the fascinating sounds produced by some scenographic machinery that has not been replaced since the old times. For example, the mechanisms that put up and down the front curtain and move the wooden scenery. I also made recordings of old seats and doors, of an old metal staircase, of parts of the wooden stage and of wardrobes and drawers in the changing rooms. In 2005 I created a radiophonic piece in which these sound recordings were almost not manipulated or processed. For the creation of Comme un jeu des images, I wanted to take the same sound material to a more musical abstract level. My aim was to move from the original theater sounds towards abstract textures generated through computer processing and manipulation. The composition process consisted in the combination of particular rhythms, timbres and textures to construct a musical continuum of sound images. The piece ends with a short fragment from the opera Manon Lescaut by Puccini recorded on a 1940´s vinyl. This opera was performed at the Gala opening of the theater in August 1908. It was the first performance that this theater “saw and heard”. The vinyl recording was played using an old LP player that was placed in the middle of the stage and recorded from the stalls via microphones. The idea was to add to the recording a touch of the reverberation produced by the acoustics of the theater. Comme un jeu des images is dedicated to Folkmar Hein.